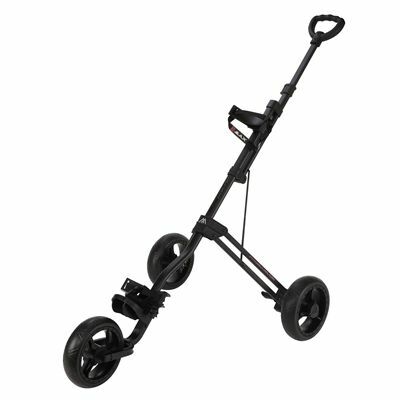 Featuring a premium three-wheel structure for effortless push, the Big Max 3-wheel golf trolley for juniors’ offers a proper solid construction with adjustable height of a handle and the bag bracket. With compact dimensions and light 5.4kg (11.9lbs) weight, the trolley is a great choice as an entry level storage for all the equipment a young apprentice golfer may need. Furthermore, it has been manufactured to last for a long time, at least until a youngster gains much more experience and skill. Big Max shows the confidence in the quality of the trolley by granting two years of warranty. for submitting product information about Big Max Junior Max 3 Wheel Golf Trolley We aim to answer all questions within 2-3 days. for submitting product information about Big Max Junior Max 3 Wheel Golf Trolley. We aim to answer all questions within 2-3 days. If you provided your name and email address, we will email you as soon as the answer is published. for submitting product review about Big Max Junior Max 3 Wheel Golf Trolley.